3 artists: one exquisite wall is an exhibition of exploration, collaboration, and experimentation. 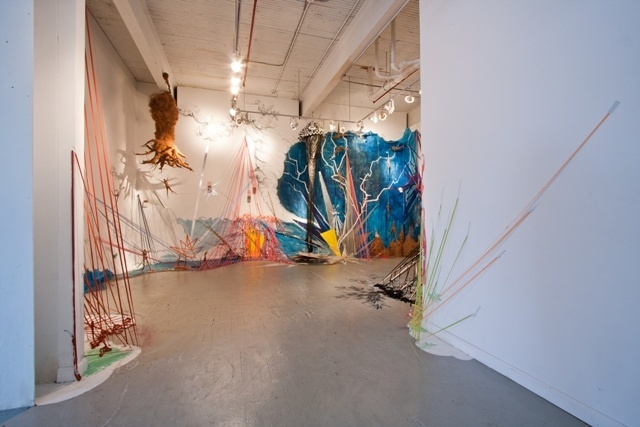 The installation explores the relationships between artist and surface; artist and artist; and the possibilities and difficulties of the collaborative process. Over a period of two weeks, three artists with distinct styles spent days alone in the gallery, adding to and altering the work done previously by the other two artists. The artists did not know each other prior to this project, and they did not speak to one another until the wall was complete. Our hope is that 3 artists: one exquisite wall opens up discussions about the benefits, challenges, and impact collaboration can have on the art making process.